From a modest beginning near downtown Houston in 1954 with Clarence sharpening hand saws and blades and his wife “Sis” waiting on customers, Circle Saw grown with one basic belief: Solve the customer’s problem. From that, Circle Saw has grown to a company that ships across Houston and across the country. They sharpen cutting tools and repair most major brands of electric, air powered, and 2-cycle gasoline trimmers, chainsaws, and blowers. Circle Saw sells and services an immense line of Professional Grade hand and power tools. That’s only possible because of Circle Saw’s diverse staff and their enormous knowledge base to help solve your problems. That’s something you won’t find at those giant stores that sell tools on Aisle 10. After all these years, Circle Saw is still family owned, family operated, and committed to solving the customer’s problem. 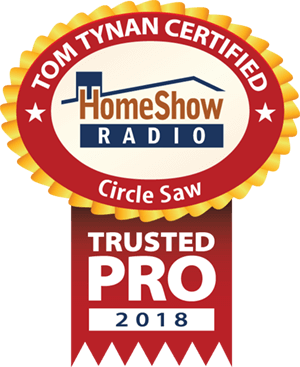 Serving the Greater Houston area, Circle Saw Builders Supply is a trusted HomeShow Pro, certified by HomeShow Radio’s Tom Tynan. How can Circle Saw help you? • NiCad vs Lithium Ion: Which battery is better for cordless tools?